This application controls mechanical pan and tilt of Qcam Orbit AF QCAM-200R. This is free software. Please download from this link. I tested driver version 13.31.1044.0 that installed by windows update. This application includes two execute files. 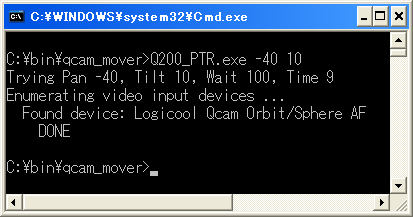 This is the main file of QCAM MOVER developed on Visual C++ 2010 Express edition. Q200_PTR has 4 arguments. You can also omit these parameters. "Q200_PTR.exe -40 10 300 20"
My QCAM has 128 steps for horizontal direction, and 54 steps for vertical direction. So, to initialize, you have to execute two commands. "Q200_PTR.exe 180 180" and "Q200_PTR.exe -64 -27"
This is the GUI of Q200_PTR.exe, developed on Visual Basic 2010 Express edition. So, you needs ".netFrameWork 3.5" or later and Q200_PTR.exe. Left and Right buttons will move your QCAM to 8 steps, and Up and Down buttons move 6 steps. RMove button will move relative steps for number of RX and RY. AMove button will move to absolute position. but it may be not correct when you not push Reset Button. About button will show about box.